Swiss bus crash: Lessons for the Dublin Port Tunnel? It seems that the future design of Swiss road tunnels may be changed based on last month’s tragic bus crash in which 28 people died, including 22 children. The initial cause of the crash at the Tunnel de Geronde, near Sierre, in Switzerland is still unknown. But the fact that the bus impacted the flat face of a lay-by wall at 90 degrees contributed to the severity of the crash. 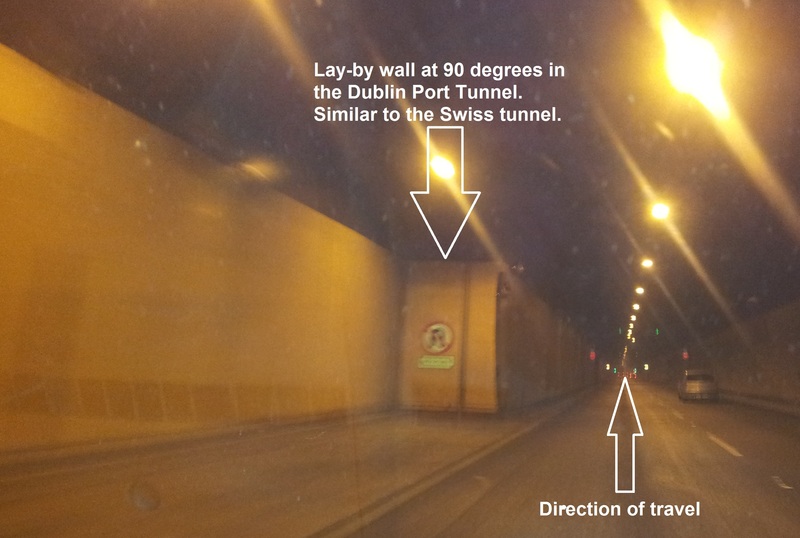 The Dublin Port Tunnel lay-by walls also share the same wall design that the Swiss are investigating. So any conclusions that the Swiss come to should be reviewed in road tunnels in Dublin and the world over. In the meantime, if applicable, tunnel operators could consider placing impact barriers on front of these walls to soften any vehicle impact as a short term solution. The port tunnel is in my opinion quite safe compared to some others. Queensway tunnel between Liverpool and Birkenhead for example. Two lanes of traffic in each direction with narrow lanes and no central divide. Thank sounds less than ideal alright. Maybe a precast concrete central divide should be installed.